Please contact Scott MacAskill at scottmac132@gmail.com to see if you can get an invitation to participate in the on field flag ceremony. You need to be there by 3:45! 4:00pm: Meet at the large free standing Quakes logo located outside the Box Office windows. From here you will need to check in, get a wristband, go through security and enter the stadium. Please keep in mind that once inside the stadium you cannot leave. Practice will take about 30 minutes. Field Entrance Location – 6:40pm: Meet at the ramp leading to the field near Section 101 to perform the ceremony. Attire: Jeans and sneakers (no heals or sandals!). Quakes will provide shirts. 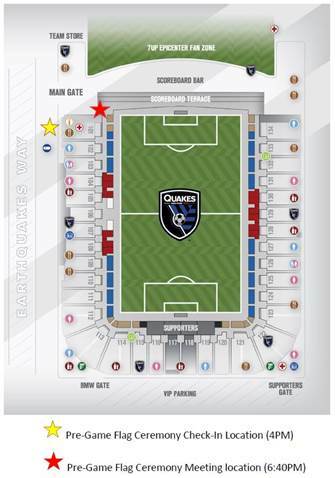 Discount tickets for the April 24th San Jose Earthquakes fundraiser are on sale until Monday. Click the banner below for information on how to buy tickets.